Another of the Sagittarius emission nebula group, M20 is known as the Trifid. Not Triffid as in the day of but Trifid as in the three dark dust lanes that trisect the red or emission part of the nebula. 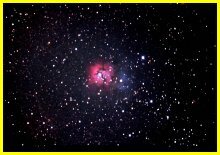 But there's more to M20, for alongside the bright Trifid there's a second area of nebulosity, much harder to see visually. This is a reflection nebula. 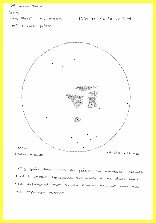 It is cooler than the emission part, and rather than the gas cloud emitting its own light it is merely being lit by reflected light from the bright star within it. The first image is 35mm, the second is digital.